A WHITEINCH woman who took a stab at a crime writing competition has beaten hundreds of entries to be named the winner of a world-wide short story contest. Sarah Reynolds submitted her entry ‘Natural Causes’ to the competition launched by Glengoyne Highland Single Malt as part of Scotland’s inaugural International Crime Writing Festival Bloody Scotland which took place in Stirling last weekend (14-16 September 2012). The 48-year-old was invited to the festival’s closing award ceremony, where she was presented with her prize which includes a bespoke hand-engraved Glencairn Crystal Decanter and an exceptionally rare bottle of 35 Years Old Glengoyne Highland Single Malt, worth over £2,000. In addition, her winning entry is the lead short story in a free ebook collection of the best competition entries published by Blasted Heath, and she will take part in a week-long residential writing course run by Arvon. The ebook can be downloaded here www.bloodyscotland.com. The married care home manager said: “It’s been a great honour to win this prestigious competition and to have my short story published in this way is truly a dream come true. Sarah had her entry read and reviewed by some of the most respected authors, publishers and editors in the crime literary world. Iain Weir, Marketing Director for Glengoyne, explained: “Sarah’s entry is truly outstanding and we’re delighted she has been selected as the winner. Her short story encompassed the ‘worth the wait’ theme perfectly and we’re confident she is a true star in the making. “Our involvement in this competition is a testament to our country’s unique creative contribution as Scottish crime fiction is an international success story. We understand that crafting a great crime novel takes time, care and attention to detail, but the results are worth the wait. The same attributes are crucial in making Glengoyne Whisky’s natural, unpeated taste and flavour. Crime author and Bloody Scotland event organiser, Gordon Brown, commented: “I’d like to extend my congratulations to the winner and hope she goes on to have further success. With UK retail sales for crime fiction now worth over £143 million, the genre has never been more popular. Bloody Scotland had over 20 events and hosted over 40 UK and international authors, including Scotland’s own Ian Rankin and Val McDermid. Named by VisitScotland as the Year of Creative, 2012 is a landmark date for Scottish crime fiction. Bloody Scotland also celebrated the 125th anniversary of the publication of the first Sherlock Holmes story, the 35th anniversary of William McIlvanney’s ‘Laidlaw’, the father of ‘Tartan noir’ – and the 25th anniversary of the first Rebus novel by Ian Rankin. 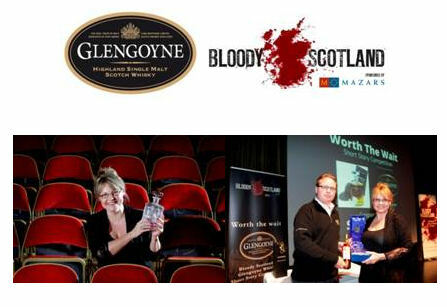 For further information on Glengoyne Highland Single Malt visit: www.glengoyne.com.